You know what rules? CAMPING. You know what else rules? BEARS. Oh, and wolves. Don’t forget wolves. Or pizza. Pizza is awesome. I’M GETTING SIDETRACKED ALREADY. Point is, camping rules, but introducing bears into camping can cause a few complications. Even though I don’t get too wild when it comes to outdoor adventures, I do love me a good camping trip. If you’re sleeping in a tent, you’re going to have a good night. Well, unless there are potential backwoods murderers or animals with big teeth or maybe you’re lost, all of which happens in Backcountry. 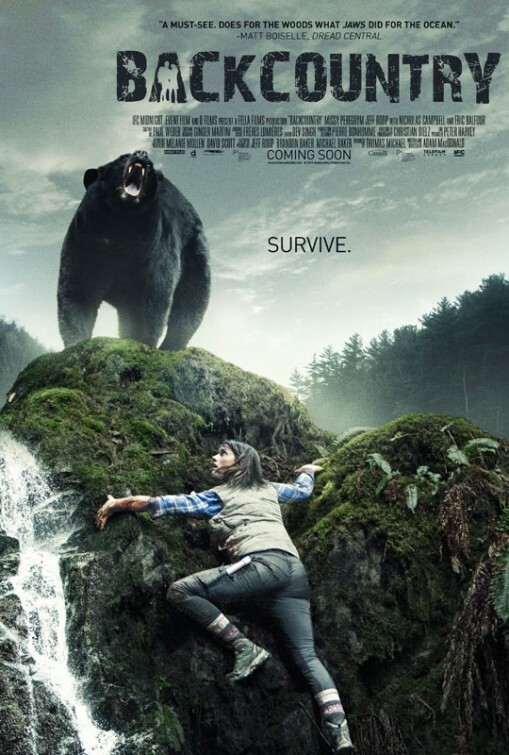 Admittedly, I knew going into this movie that it wasn’t my particular cup of tea, but if you like a good “camping gone wrong tale,” then Backcountry is probably for you! Alex (Jeff Roop) takes his girlfriend Jenn (Missy Peregrym) to his favorite nearby National Park to show her the lake he used to hike to as a kid. It’s the end of the season, which means there’s less people, but it also means there’s more privacy. Despite being warned by a Ranger that his favorite trail is closed for the season, Alex leads Jenn off-trail regardless. 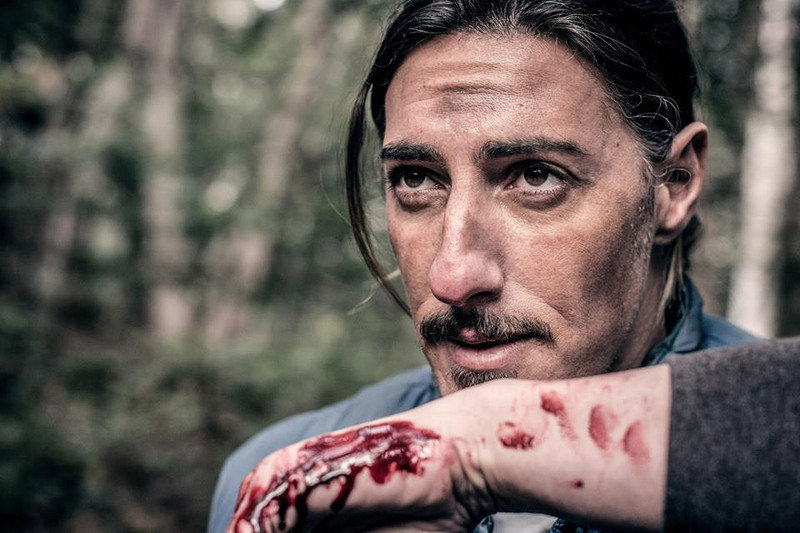 One their first night of camping, a man arrives (Eric Balfour) and, although he offers food, he makes sure to assert his male dominance over Alex. NOT A GOOD WAY TO START A ROMANTIC TRIP. As the couple treks farther into the woods, the path looks less and less familiar. What Alex does make note of are the signs that bears have recently been in the area. As the days pass by, Alex and Jenn are stalked by something in the woods and they have no way of reaching safety. They’re stuck in……….BACKCOUNTRY! Balfour’s slimebag hair is ON POINT. Sorry for capitalizing “backcountry,” that wasn’t the movie’s tagline or anything. I’m just, ya know, being dramatic. As I mentioned earlier, survival horror that pits humans against the elements aren’t typically my thing, but that doesn’t mean that Backcountry is a bad film. Not by a long shot. This is writer/director Adam MacDonald‘s first feature film, but you couldn’t really tell that from watching it. I was especially impressed at the cinematography of the woods and sound design of tent scenes as they both accurately represented what it’s really like to go camping. Utilizing a small cast in the woods without too many locations might tip people off to a lower budget, early career shooting style, but it looked just as good, if not better than similar films with much larger budgets. This is reallllllllllll awkward. Just, trust me, this part was awkward. The most impressive thing about Backcountry is the dynamic between Alex and Jenn. Both actors put in solid performances, but it’s how their relationship plays out and the shift in power that felt authentic. You learn a lot about a relationship when you get lost with someone. Whether it’s a romantic relationship or a friendship or even a family member, when you feel like you’re at the end of your rope, the way you react to the other person is very telling. What Backcountry does well is manage that struggle in power, and more importantly, the struggle in blame, sympathy, and apologies. Any tension in any scene can be blamed on either person, the audience can see both sides of the situation, the audience blames and pities both people, and both characters realize they are partially to blame. Rather than creating one “bad guy,” or create huge differences in who’s controlling each situation, the writing helped keep the tension even-keeled throughout as opposed to large peaks and valleys. The introduction of Balfour’s character also helped tip the dynamic of the main couple and showed the audience a lot of information about their dynamic. Road flares are GREAT for illuminating everything in a five foot radius. Unfortunately, I have a hard time enjoying a movie where nature, or representations of nature, are considered to be a villain. If it’s an animal being vilified, I like a movie even less. Backcountry manifested “nature” through the use of a bear that followed the couple around, acting as an element of danger and potential violence. It wasn’t a completely ridiculous form of nature as I’ve seen in other movies, nobody claimed the bear was a revenge killer or anything like that, but the audience is taught to fear the bear. Everything the bear did, for the most part, was natural bear behavior, feasibly, but I can’t really shake animals ever being considered a villain, so I can’t fully endorse it. However, I know lots of people can enjoy movies like this without as much stigma attached, and you guys are gonna like this one! Similar to 2013’s In Fear, Backcountry took a familiar concept but threw an interesting relationship dynamic to make it stand out from films in the similar sub-genre of “survival horror,” but still, I really like bears and just want everyone to be nice to them.